Happy New Year, everyone! I hope you all had a wonderful start to the year! My New Year's Eve was fraught with more drama and unpleasantness than I would have hoped for, but I'm seeing it as a bad start to the year means that things can only get bigger and better from here on! For all the things midnight was not, the first day of the year made up for. We had a gloriously hot and sunny summer's day here in Melbourne, which meant good friends, beer, and a splash in the pool were required to start the year right. The afternoon before, I had asked Liam to set up a mini wading pool for me so that I could escape the heat. Early in the morning we realised this was not going to be big enough, as four of us crowded around the tiny thing to hang our feet inside. So we decided to get to work and set up the big pool. My poor abandoned little pool watched on, while our friends paddled in the big pool! I soon put it to use though, by throwing it inside the big pool and floating around in it all afternoon, cider in hand. Bliss! 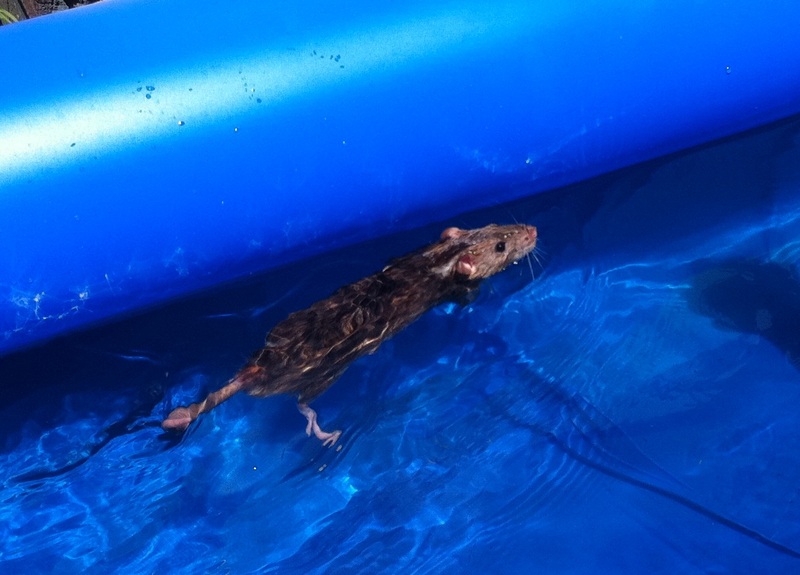 And of course, we couldn't forget the rats who also enjoyed a bit of a swim and a sunbake!! We let them in the water to cool down a little bit, and then set them in the shallow side of the pool to dry off on a milk crate. Then I heard this splash, as little Bruce dived into the water to swim a lap of the pool! Spiderman followed not too long after, but Teddy and Pancake were happy to soak in the sunshine on the milk crate, as you can see! Too cute. Rocket, as usual, watched their every move and guarded them like a hawk. It's days like these you wish would never end. OMG I don't think I have ever seen rats going for a swim! :) HAHAHAH how cute.